IN recent months it has produced the handsome and affordable Ghibli sedan. It has unveiled the alluring Alfieri coupe concept. And it has further developed the curvaceous Levante SUV that will debut in 2016. Several luxury brands of late are brilliantly readying themselves for dramatic product and image improvements in the next few years. These are automakers fallen from superstar status decades ago but that are primed for a comeback. Maserati is one of them. So, this is as good a time as any to address the Maserati Quattroporte Q4 S, its US$107,000 (RM361,166) AWD sedan. Ghibli recently overtook the flagship Quattroporte in US sales this year, an expected and telling sign about the healthy future of the company. That mid-sized sports sedan is the most exciting and most significant part of chief executive officer (CEO) Sergio Marchionne’s goal to sell 50,000 Maseratis worldwide by 2015. But Quattroporte is a touchstone for the marque, both as a measure of where it has been and where it is going. It’s spacious and capable in inclement weather. It is not the fastest car of its general size and price on the market. It is also not the tightest handling and supremely engineered of the lot. Nor is it the most plush. But the Maserati Quattroporte Q4 S does have a certain style. Driving it makes you feel, if not suave like in the Audi, at least little nasty. It doesn’t have real swagger like an Aston Martin, but it has a bit of an ego and the personality to match. I just wish the engine had more of a growl to back that up. I have never been a fan of the modern Maserati look — the shark gills on the sides, the huge toothy grill grin, the wide stance that apparently feels the need to visually clear its throat to everyone on the road. Of course, they are exactly the reason why some people adore the Maserati. “Our buyers are extremely passionate,” Peter Grady, president and CEO of Maserati North America, told me recently. He said the level of engagement is very high for current owners, and that the rate of closing a sale once someone comes in to the dealership is higher than 80%. The trouble is getting fresh faces inside the dealership in the first place, and I’m not sure Quattroporte is the car to do it. That said, the new day-running LED headlights and wraparound LED rear lights, twin oval tailpipes and standard 19-inch rims work well together to present a uniform look on the car. The red brake calipers on the spec car I received looked sporty. And I do love the royal connotations and old-school charm of that famous Maserati trident evident throughout the wheels, sills, leathers and hood of the car. The 8.4-inch touchscreen, in particular, is perhaps the most intuitive and responsive one in its class. It controls the front seat heaters, climate, radio, navigation and drive modes. The back seat feels like a hollowed-out bunker. Massive. You might as well bring a change of clothes and a deck of cards for this thing. It’s not especially plush, but it has decently appointed leather and wood like a higher-end chain hotel room or the cabin on a private jet. It’s a good choice if you want something a little lean but still big enough when it comes to comfort. 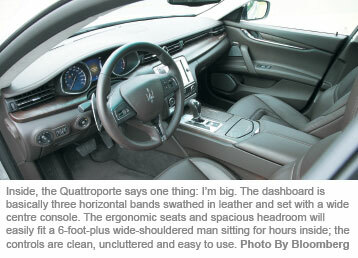 Driving the Maserati Quattroporte is not especially memorable or thrilling. But I have a feeling most of the people who buy a Quattroporte don’t buy it for its performance prowess anyway. It does feel capable, if heavy, around corners, and gains speed along highway stretches. The car feels smooth as it accelerates, yes, but it’s the smoothness of a large beast that has determined to finally gather some speed and gallop in the right direction. Fine, then. But it’s not a smooth transition to move it from drive to neutral, or from neutral to reverse. Instead, it feels like you’re pushing buttons and pulling levers every which way like on some sort of trolley. This article first appeared in The Edge Financial Daily, on December 1, 2014.